It can be such a chore to figure out what to make for dinner during the summer months. Kids are home. Days are long and crazy busy. It’s hot and I don’t want to turn on the oven. Sometimes just figuring out what to make can be daunting. Right?! I tend to navigate towards recipes that incorporate fresh seasonal ingredients. I also love quality products that I can count on to be nutritious and affordable. Associated Food Stores has just released their new Food Club brand which is a national brand equivalent that has offered quality products since 1945. When you shop Food Club you’re saving money on delicious products that are informative with easy to shop nutritional labels. Food Club also has a double your money guarantee and is just like your national brands, but at a fraction of the price. How can you go wrong purchasing products like this? You can find them at your local Wyoming Ridley’s and Obo’s Market stores. Be sure to check them out. 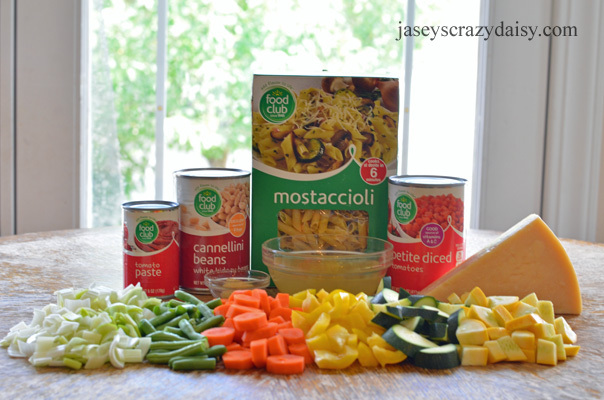 Food Club products offer some of the perfect ingredients for my Summer Minestrone Soup. It’s a delicious veggie packed lighter soup that is perfect for summer nights. You don’t even have to turn the oven on! With a few staple pantry ingredients, it’s a wonderful way to use up those vegetables that are starting to come from your garden. I love to serve summer minestrone soup topped with chopped fresh basil and grated Parmesan cheese. I throw in some dinner rolls to complete a delicious summer meal. Here’s a line up of your ingredients, minus the basil and spices because, well I forgot them. I just love all the colors! Along with a few staple pantry ingredients, this is a delicious way to use vegetables from your garden in a delicious summer minestrone soup. Heat 1 Tbsp of olive oil in a large, stock pot on medium high. Add the diced leeks, celery, carrots, and bell pepper. Cook vegetables for 8 to 10 minutes until softened, lowering the heat to medium to prevent browning. Add the minced garlic and cook until fragrant, about a minute. Add chicken stock, diced tomatoes, tomato paste, thyme, and bay leaf to the pot. Increase heat and bring to a simmer. Add zucchini, summer squash, green beans, cannellini beans, and pasta. Bring back to a simmer and lower the heat maintaining a steady simmer. Cook for 10-15 minutes until the vegetables and the pasta are cooked through. Add salt to taste (usually about 1/2 to 1 teaspoon but this can vary depending on the saltiness of your other ingredients. Garnish with thinly sliced fresh basil and grated Parmesan cheese. Serve with dinner rolls for a delicious summer meal. If you'd like to make this soup a little heartier, add 1 lb browned sausage, or kielbasa. Also, sometimes if I want my soup to have a little zing, I add 1/2 to 1 teaspoon of balsamic vinegar. Isn’t it nice to have delicious affordable products to make your recipes with? Because we are so excited about Food Club, I am partnering with Associated Foods to giveaway a gift basket worth $50 filled with samples of their new products! How much fun is that?! It will include these great products. Please the form below to enter. This giveaway opens immediately (US only, please) and closes at 12:00 AM on 7/26/2018. Winner will be announced here on the Rafflecopter form, contacted by email and has 48 hours to claim their prize by responding with their mailing information or another winner will be drawn. Good luck:)! The sponsor is responsible for fulfilling the giveaway prize. If you love soup, join me on Pinterest and follow my board dedicated to soup recipes. This is a sponsored post. I was compensated to write this post. As always, my opinions remain my own and I wouldn't recommend any products that I wouldn't have in my home. Introducing PowerCapes and a GIVEAWAY!!!! One of my favorite things to have in the summer is a salad of mixed greens, prosciutto, pears and Gorgonzola cheese with a balsamic vinaigrette. One of my favorite summer dishes is Caprese Chicken Kabobs — or anything on the grill. I LOVE COBB SALAD IN THE SUMMER. I love grilled food in the summer! Zucchini is one of my very favorites! I love to make burrito bowls with fresh veggies from the garden. In the summer I am happy to have a nice fresh salad.